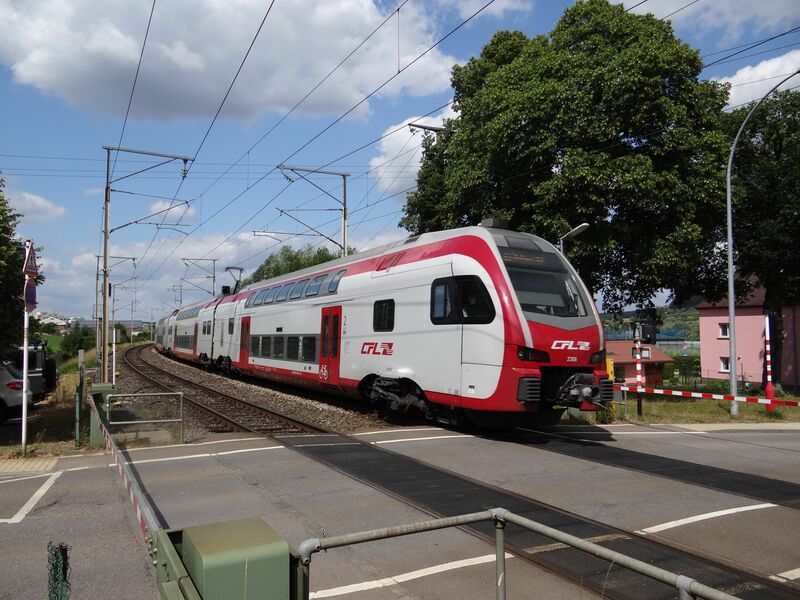 This CFL train no. 2306 is a Swiss made Stadler KISS of CFL's class 2300, a three coach double decker electric multiple unit. CFL uses them in services to Germany. Typically these are run solo from Luxembourg to Trier in Saarland, Germany and coupled there with DB's Stadler FLIRT trains, which are similar but not double deckers. 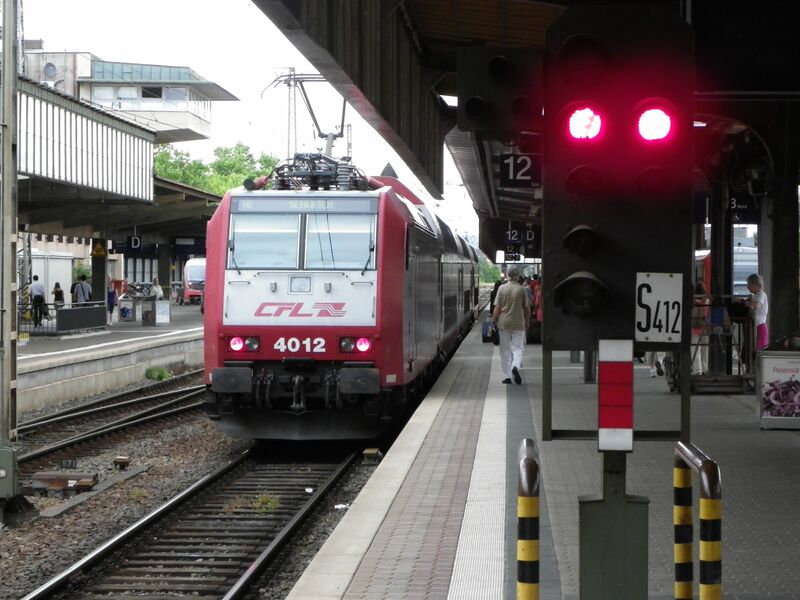 Then the service continues jointly deeper into Germany, typically to Koblenz. Picture by the small station of Munsbach, Luxembourg, 9.7.2015 by Ilkka Siissalo. 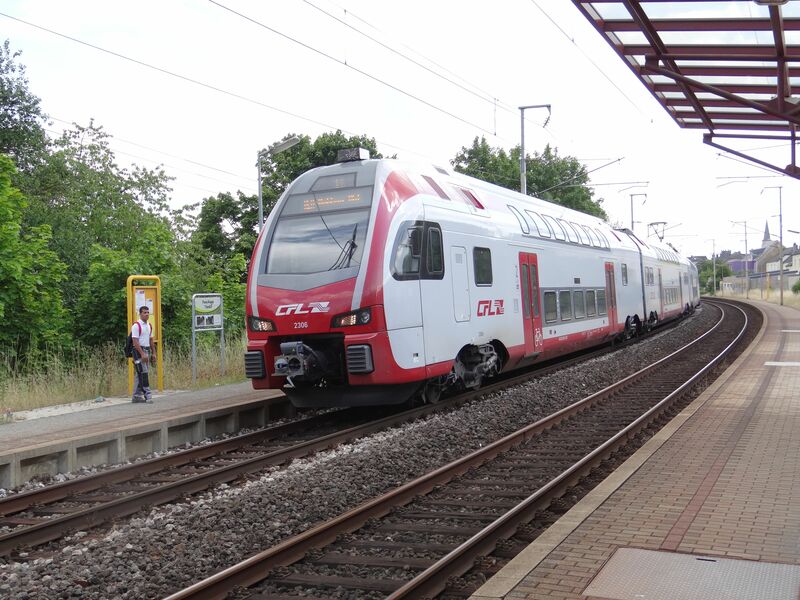 Another picture of the CFL KISS train 2306 as it stops at the small station of Munsbach. 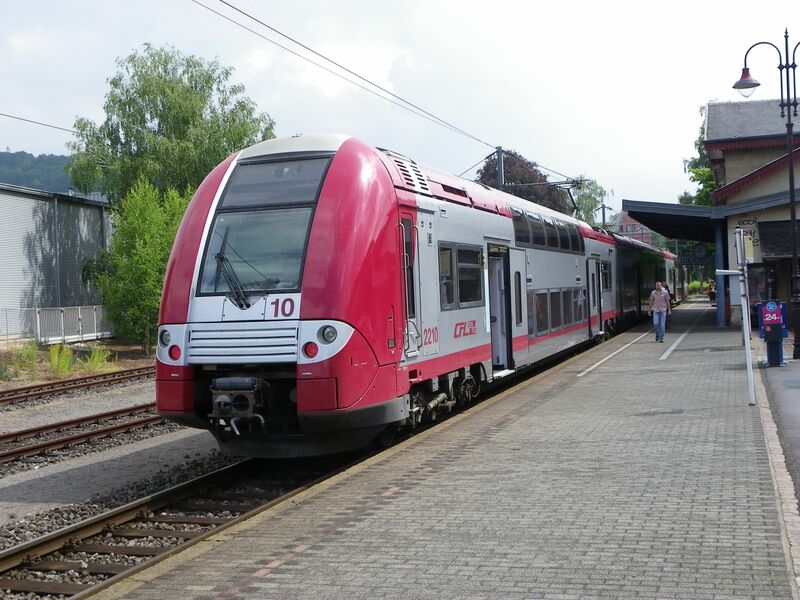 This was a regional express service RE11 from Luxembourg central station to Koblenz in Germany. Picture in Munsbach 9.7.2015 by Ilkka Siissalo. CFL no. 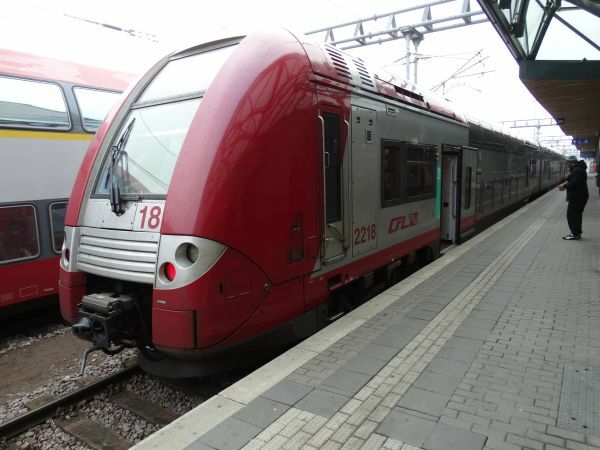 2218 of the class 2200 is a French Alstom built three coach doubledecker electric multiple unit, which CFL uses in services to France (e.g. Thionville) but also in services within the country, for example often at Luxembourg - Wasserbillig trains. It belongs to Alstom's Coradia Duplex family of trains. CFL has bought 22 of them and they are a very common sight within the small country. Picture at Luxembourg main station 17.12.2016 by Ilkka Siissalo. Another picture of the same CFL no.2218 as above. Picture at Luxembourg main station 17.12.2016 by Ilkka Siissalo. 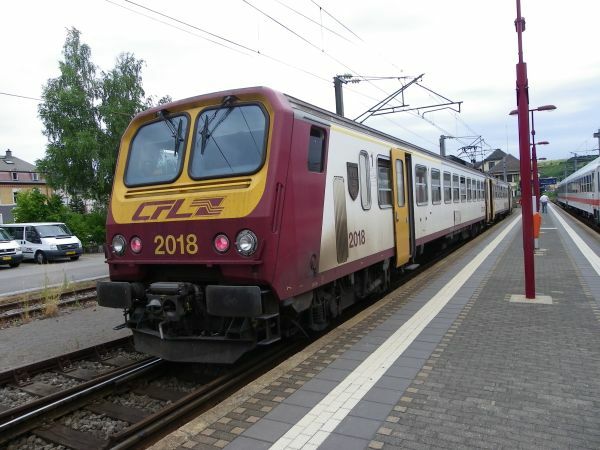 CFL class 2200 train no.2210 at Diekirch station 13.7.2010. Photo by Ilkka Siissalo. CFL class 2000 has become somewhat a rarity these days. It is fairly uncommon to see these trains any more, except that during weekends when there is considerably less passengers than during workdays, occasionally some of the double decker coach rakes get replaced by one of these small oldies. This was the case here also as this picture was taken 17.12.2016. Normally the Luxembourg - Wasserbillig service would have had a train consisting of a series 3000 locomotive and four double decker coaches, but on a Saturday this small old train was enough. These are old French trains. 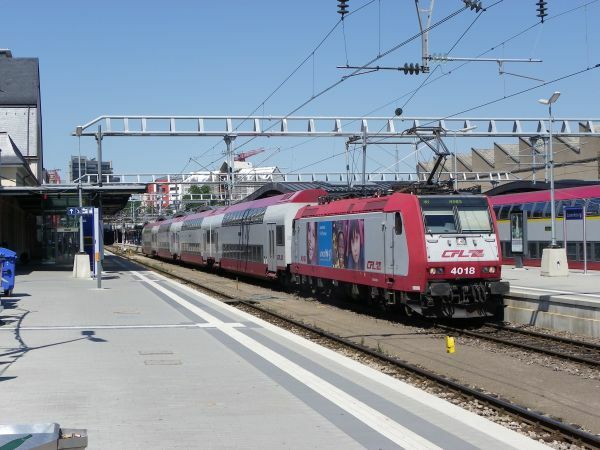 They were built in 1990-1992 by a consortium of De Dietrich, ANF and Alsthom and are similar to SNCF's Z 11500 class. Picture at Luxembourg main station 17.12.2016 by Ilkka Siissalo. A similar train no.2018, this time photographed at Wasserbillig station in 2010. 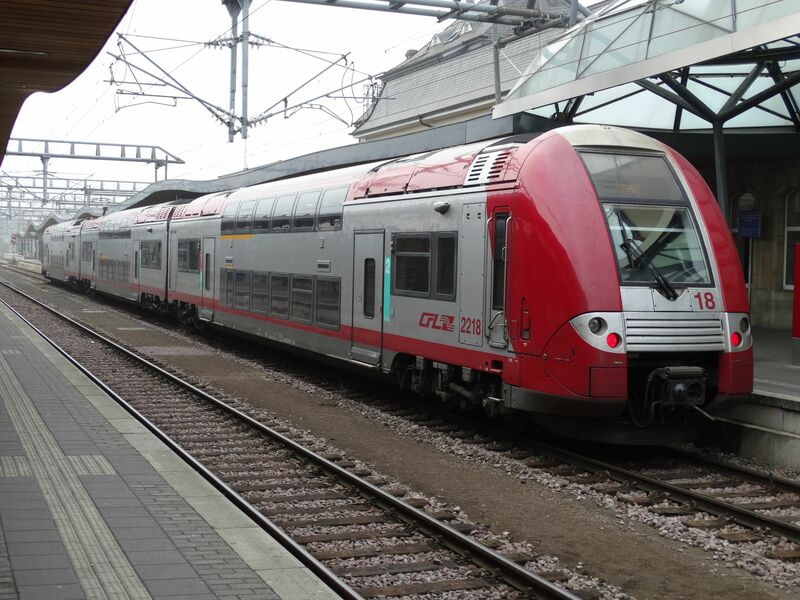 In those days these class 2000 trains were still the standard rolling stock between Luxembourg and Wasserbillig. Later newer Bombardier double decker coaches and French built class 2200 trains have replaced them - except sometimes during weekends. Picture at Wasserbillig station 12.7.2010 by Ilkka Siissalo. 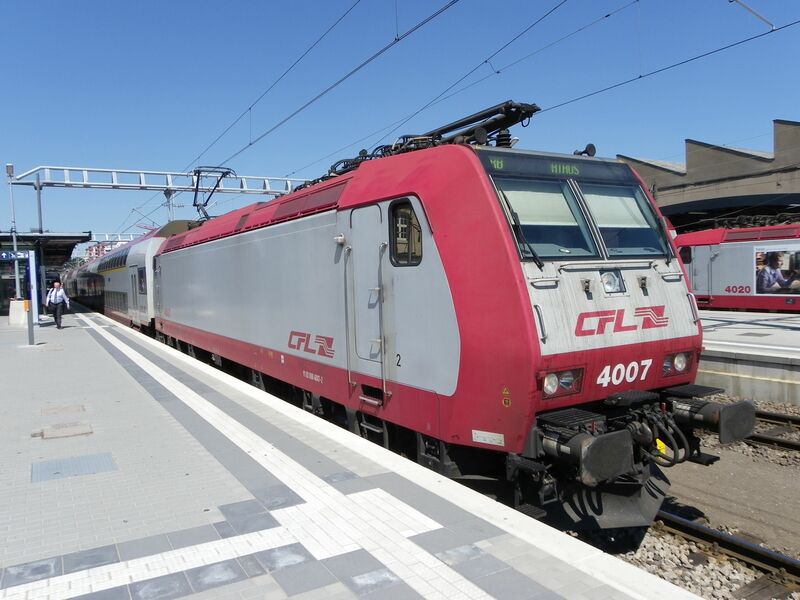 Much of Luxembourg's regional passenger train traffic is today handled by rakes of double decker coaches, typically three or four coaches long, and originally always pulled or pushed by CFL's Bombardier TRAXX locomotives of the class 4000, but more lately typically by the French built class 3000 locomotives. This is the Bombardier built steering wagon and two other coaches, pushed by a TRAXX at Trier main station in Saarland, Germany 12.7.2010. 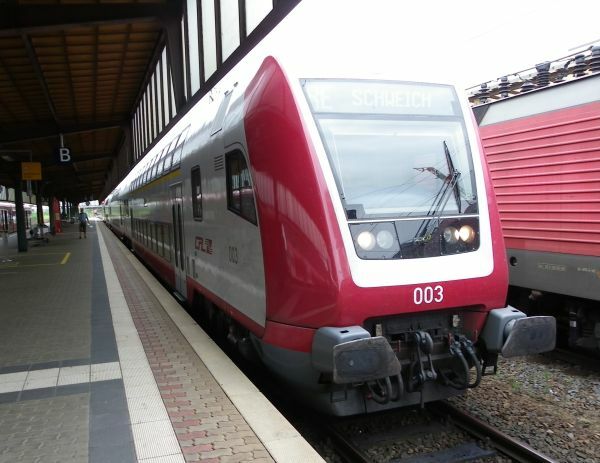 In 2016-17 these trains have already been replaced by Swiss made Stadler KISS doubledecker trains as seen at the top of this page. Picture by Ilkka Siissalo. This is the same train as in the picture above, but now showing the pushing CFL locomotive no. 4012. 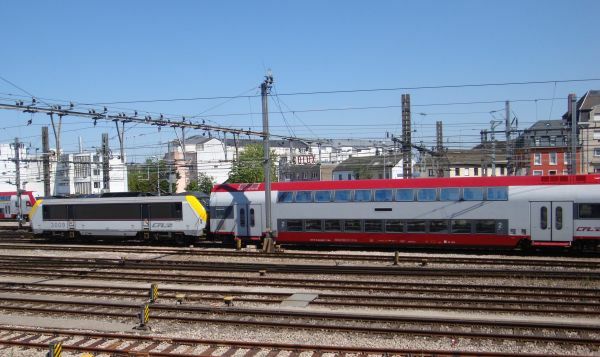 It is a second generation multiple electric system Bombardier TRAXX, similar to the German class 185, except with train destination displays similar with those that the German class Br 146 TRAXXes have. Trier main station in Saarland, Germany 12.7.2010. Picture by Ilkka Siissalo. 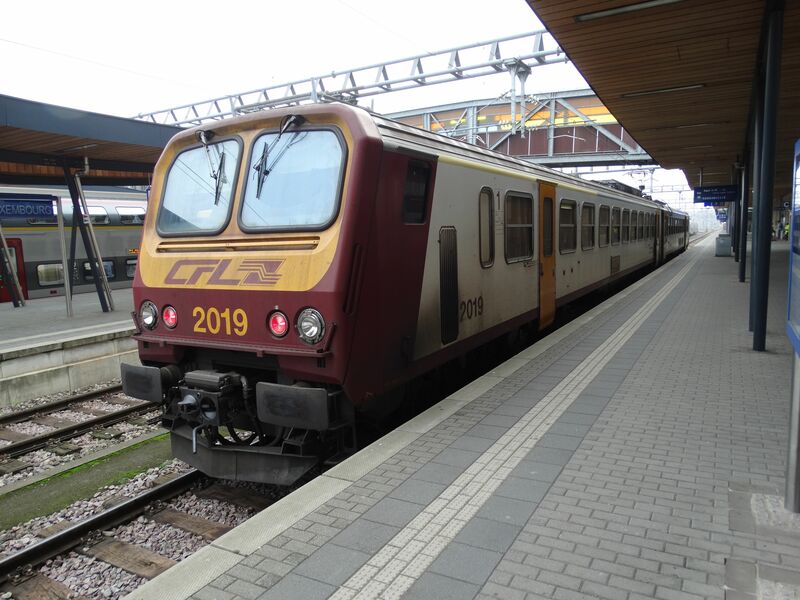 Another one of the CFL class 4000 Bombardier TRAXX second generation locomotives with Bombardier double decker coaches. Picture at Luxembourg main station 19.7.2010 by Ilkka Siissalo. 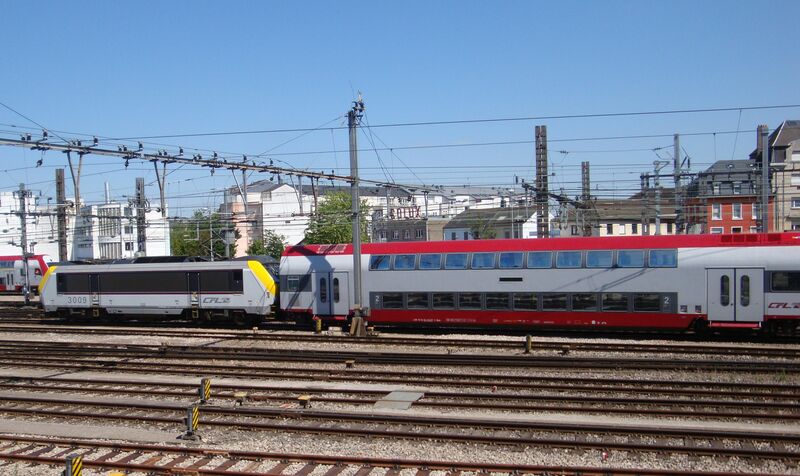 One of the Bombardier TRAXX locomotives class 4000 no.4018 ready to pull a rake of Bombardier double decker coaches as a regional service to Athus. Picture 19.7.2010 at the Luxembourg main station by Ilkka Siissalo. CFL locomotive 3009 of the class 3000 pulling a rake of Bombardier built double decker coaches into the Luxembourg main station. Picture 19.7.2010 by Sanna Siissalo. 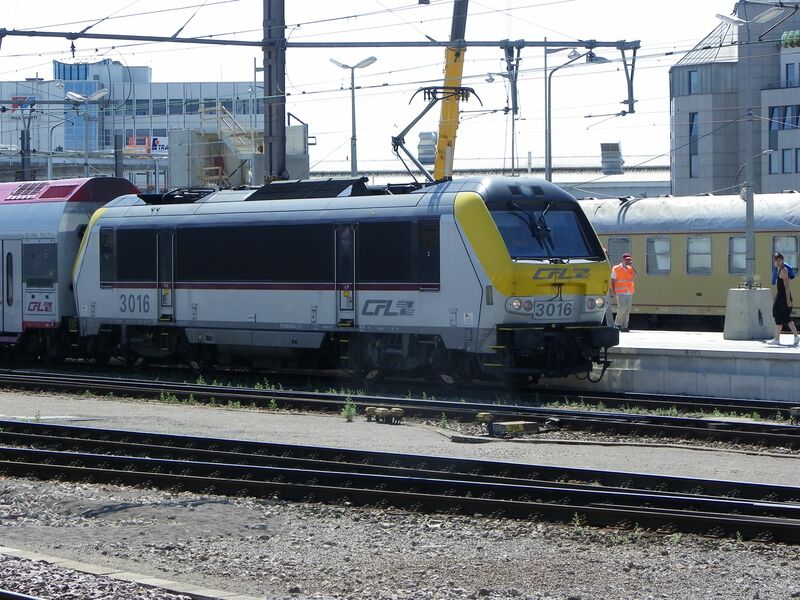 A class 3000 locomotive, number 3016 is ready to push a rake of Bombardier double decker coaches from the Luxembourg main station. Picture 19.7.2010 by Ilkka Siissalo. When in 1956 the first electrified line Metz - French/Lux border - Bettembourg - Luxembourg reached the Luxembourg main station, that was the time when CFL first needed electric locomotives. The line came from France with the French electricity and security systems, so it was natural to buy French locomotives. CFL got between 1958 and 1960 20 of these series 3600 machines, famous as "L�tzeb�rger Krokodilen" (crocodiles of Luxemburg), which were identical with the French SNCF's class BB 1200. 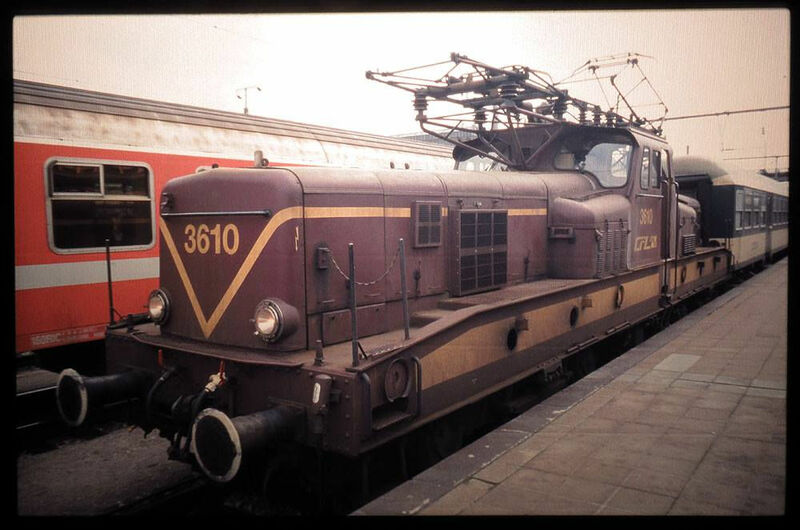 It is/was a four axle locomotive with a top speed of 120 km/h and it was used mainly in regional passenger traffic and shunting. Another nickname of the machine was "Streckeisen", clothes iron. Picture at Luxembourg main station in April 2001 by Jarkko Korhonen.